The police officer wanted him to dance. "Do the chicken noodle soup for me," he said. The officer claimed it was the only way he'd let John Hector go. It was supposed to be a joke, but Hector didn't find it funny. After all, he and his friend were handcuffed in full view of the public. The pair were driving to get some food when they were pulled over by the police, who then forced them to sit on the kerb with their hands bound. They were never arrested, let alone charged with a crime. That's because they hadn't committed one. They were simply caught in an NYPD stop-and-frisk operation. Protesters around the planet: A better world is possible! In cities all over the world and across the U.S., thousands of protesters gathered yesterday inspired by Occupy Wall St - hundreds were arrested in various cities around the U.S. More reports to come! Photos are being posted here. The day started with an anti-war march through Manhattan ending at Zuccotti Park / Liberty Plaza (which still hasn't been shut down). An estimated 15,000 people shut down Times Square, chanting, "We are unstoppable - another world is possible!" Thousands more gathered in Washington Sq. Park and marches and rallies popped up across the city. World Can't Wait organizer on the scene reported "people are high on struggle like I haven't seen in decades." See World Can't Wait on Facebook for the latest, including videos, links to news coverage, and more photos from the occupation of DC and protests in Chicago, LA, and San Francisco. 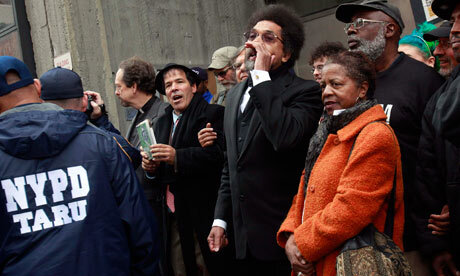 Cornel West speaking in LA. Protesting the drone exhibit at the Air and Space Museum in DC. The Museum of Torture on display in DC. Davis, who was put to death Thursday night after more than a decade of controversy over his case, was convicted of the murder of an off duty police officer, Mark MacPhail, on August 19th, 1989 in Savannah, Georgia. He was sentenced to death two years later. Objections over the case’s resolution emerged as seven out of the nine eyewitnesses recanted their testimonies, and Davis’ impending execution gained national and international attention from organizations such as Amnesty International, and the NAACP. World leaders, including Desmond Tutu, urged the court to review his case, and it was reported that “Pope Benedict XVI’s US envoy sent a letter pleading for his life.” Former US President Jimmy Carter, called the decision “unjust and outdated” and urged Georgia’s Board of Pardons and Parole to review Davis’ conviction. Global protests commenced in the streets and online, where Twitter users exchanged messages under the hash tag “Too much doubt.” The board ultimately denied Davis clemency and he was put to death by lethal injection at 11:08 pm on Thursday. Women from World Can't Wait and Code Pink agitating and bannering from on top of plywood submarine at gate of Moffett Field. Silicon Valley, California. On Sunday Sept. 25, an emergency protest called by Code Pink Women for Peace, World Can't Wait, and the ANSWER Coalition was at the gate of Moffett Field when Obama landed for a campaign fundraising trip here. Obama's motorcade took him right past our signs and shouts and banners, and the "Guantanamo prisoner" in jumpsuit, hood and chains. An activist from San Jose arrived with a pile of bold antiwar picket signs that covered the fence the motorcade drove right by. Some of the protesters climbed up on a large plywood fake submarine displayed at the Moffett Gate with our banners and bullhorn. We shouted at the Commander-in-Chief as he drove past: "War Crimes are War Crimes No Matter Who Does Them!" "Ten Years of U.S. War Crimes in Afghanistan!" "Torture Is A War Crime!" “Drone Attacks – War Crimes!” "Got Security? Stop Drone Attacks!" "The War In Afghanistan Is Still Wrong!” "Obama, Obama, There's blood on your hands -- From Iraq and Libya to Afghanistan!" In her White House press pool report, Carol Lee wrote about our demonstration: Some people were outside along the route from the airport to the highway, waving and snapping photos. 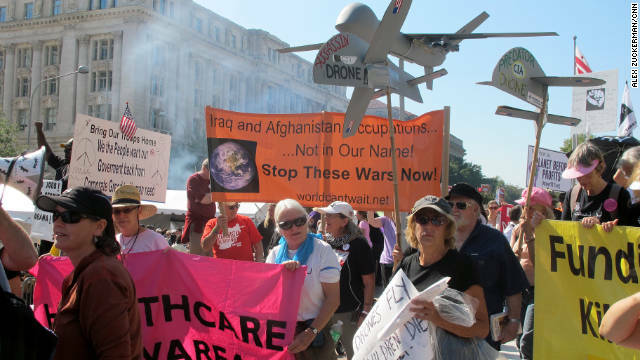 There were also some anti-war protesters who held signs like, "Stop the wars," "The war in Afghanistan is still wrong," "Endless War" and "Afghanistan 10 years of war crimes." The recent execution of Troy Davis, a black man convicted of murdering a white policeman, is reminiscent of the "terrible history" of "slavery and lynching of the black people," says Debra Sweet, director of World Can't Wait. She says African-Americans and Latinos are disproportionately subject to death penalty and incarceration in the United States. "If you look at the 2.3 million people incarcerated, mass incarceration of black and Latino people in this country, the death penalty has always been disproportionately carried out on black men," Debra Sweet told Press TV's U.S. Desk on Sunday. The 42-year-old Davis was put to death by lethal injection on Wednesday in the state of Georgia. Davis maintained his innocence till the very end of his life. Seven of the nine witnesses at his trial recanted their original testimony. The witnesses have presented sworn affidavits stating that the police pressured or coerced them into testifying against Davis. However Georgia rejected his appeal for a retrial. "Whenever a policeman dies in this country somebody usually dies and it's very often a black person whether that person was connected or not," Sweet noted. "And in this case, of course we know that Troy Anthony Davis was innocent," she said. She concluded, "It was unconscionable for the government to kill him and yet they did. It's just an outrage." She was speaking about an "Occupy Wall Street" event which is an ongoing peaceful demonstration that began on Sept 17th in New York City. The demonstrators are calling for changes in American social and economic policies. The World Can't Wait flier, "U.S. Wars on the Middle East: Wrong Because They Cost So Much? Or are they Just Wrong, Immoral, Unjust, and against Humanity's interests?" written by Debra Sweet, was included as an article in this edition of this independent publication.